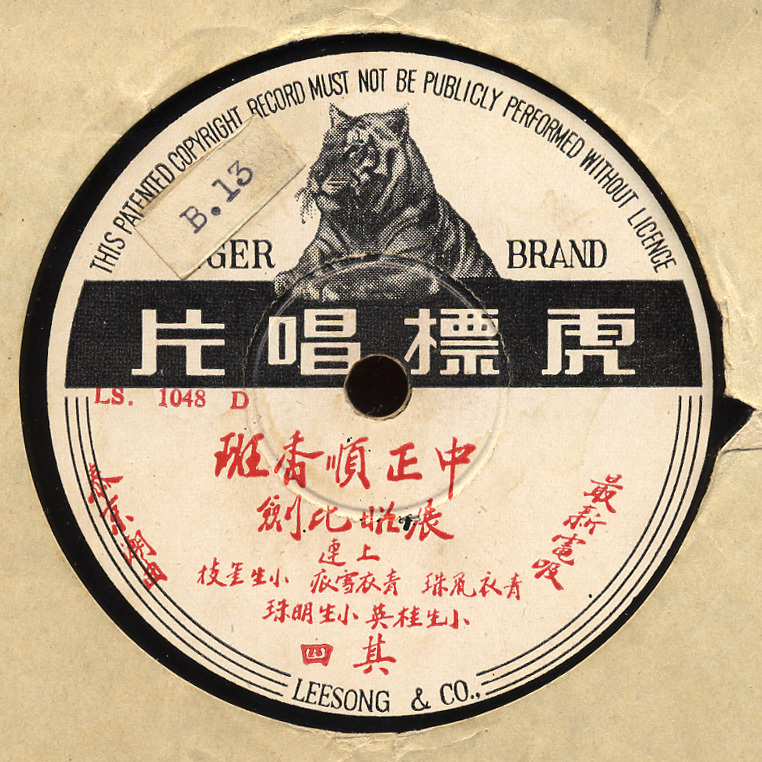 Here’s a beautiful and hypnotic Teochew Opera on the obscure Tiger label. Teochew is a Chinese dialect from the Guangdong region of Southern China. The Teochew music bears more resemblance to Southeast Asian music than other Chinese opera forms, especially the Peking opera (in fact, this was recorded in Thailand according to one of our readers, see comments for further info). This record is a great example of the measured rhythm and clear melody of the Teochew style, with little of the wild percussive effects of the Peking style. During the 18th-20th centuries there was much emigration from Guangdong into Thailand, Malaysia, Singapore and elsewhere in the region and a healthy Teochew Opera scene existed in those places until recently. Another excellent record. A definite Southeast Asian flair – really nice! Sorry Dave, I took forever! From my research for an exhibition on Teochew traditional arts in Singapore, Teochew opera and music only became popular in Singapore around 1957 with the influx of Teochew Opera movies from the Shantou of Guangdong – mainly from the Opera School there. Teochew Opera is a relatively new opera form in China, evolved from a juxtaposition of multiple opera forms that trickled into Teochew-speaking region of Guangdong (a political & economic backwater location for centuries). The characteristics of Teochew Opera & music displays clear signs of its evolution from Nan Opera (The earliest form of Chinese Opera, which all major Chinese operas have evolved from), Wai Jiang Opera, Qin Opera & Gui Opera. All synergizing together during the late Qing Dynasty to create a distinctive southern China flavour in Teochew Opera & music. In fact, my society is in the process of recording a DVD of Teochew music now, led by a famous composer & conductor from Shantou China now. We’ll be quite appreciative if you support our production. Be it advice on our DVD educational contents, or financially, it will be great. It is remarkable to note your interest in Chinese opera. justice Pao. Background is China Song (or Sung) dynasty. However, I believe there is a set of several LPs. That’s all I can describe. I asked my China teacher he said it is a professional troupe Zhong Zheng Shun Xiang Ban in Bangkok. They are still existing now. The LP is probably released 30-40 years ago. Refer to Mr Javier Li’s comment of 13/Nov/07: I think TC Opera in Singapore was already popular in the 1950’s even before the influx of TC Opera movies. As a 5 year old kid then I went to street operas staged by local troupes such as “Xin Yong Hua” and “Lau Sai Thor” performed to huge audiences. Later in the early 60’s came the influx of TC Opera movies. It was recorded in Thailand….. It says Melodies from the Capital of Thailand,and the troupe, as noted above, is a well known troupe fronm Bangkok. maybe you’re wondering where the record was pressed? As I am working on a book about record labels from Germany, I need to find out which company actually PRESSED the disc. I would appreciate a clean scan of a label, preferably without stickers AND, IMPORTANT, visible/readable information such as matrix numbers in the wax. Perhaps Telefunken (TELDEC)? 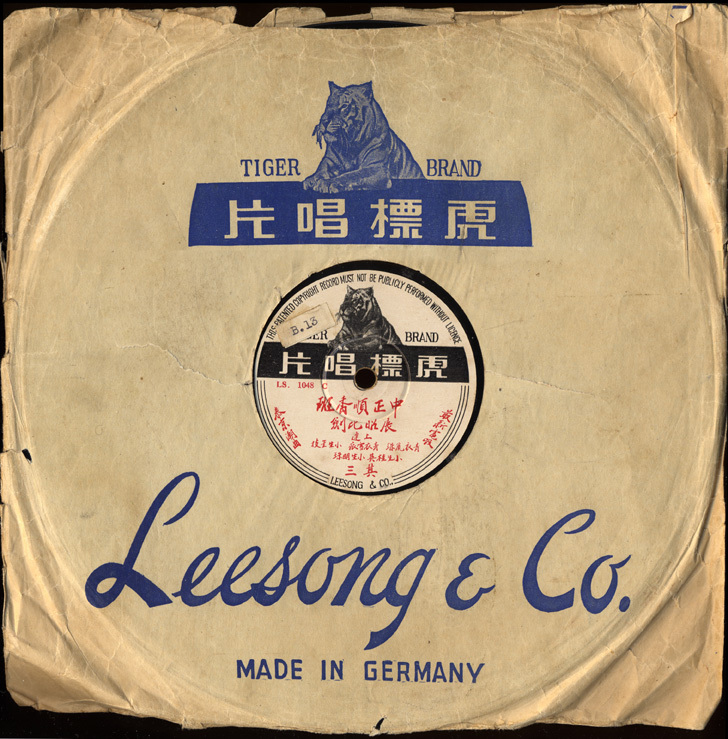 Leesong & Co may have be a trading company operating from Singapore rather than Bangkok. There were so many TC opera companies in Thailand 50 years ago. There were more 5 opera theatres in Yaoyalat (Chinatown in BKK). It is so sad that there is nothing now. There are a few TC opera in Thailand, but they are not Chinese. They are Thai who are from countryside. They can sing and dance, but they don’t know the meaning. Chinese opera in Thai is Ngiew.